Drivers in the market for their perfect crossover may be wondering which vehicle option is at the top of its class and the best option for them. 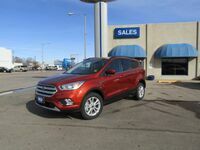 The perfect driver’s seat can be found behind the wheel of the 2019 Ford Escape from Wolf Auto Center in Kimball, NE. 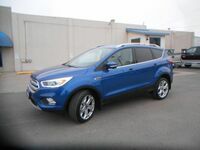 Wearing a starting price tag of $24,105, the 2019 Ford Escape is available in four sporty trims - S, SE, SEL, Titanium – that are a perfect fit for every driver. Are you wondering just how well the Escape stacks up against the competition? Continue reading this 2019 Ford Escape vs 2019 Jeep Compass comparison from Wolf Auto Center to see why so many drivers are choosing the Ford Escape. Click the link below to view all of our in-stock 2019 Ford Escape models. What are the differences between the 2019 Ford Escape and the 2019 Jeep Compass? Powered by a 2.5-liter iVCT I-4 engine paired with a 6-speed automatic transmission with SelectShift® capability, the 2019 Escape produces a powerful 168 horsepower and offers an EPA-estimated 21 city/29 highway MPG. The competing 2019 Jeep Compass is powered by a 2.4-liter I4 MultiAir® engine paired with a 6-speed automatic transmission, offering a comparable horsepower output and EPA-estimated fuel economy. Drivers have 34 cubic feet of space in the rear cargo area of their 2019 Escape. The 60/40-split-fold-flat-capable rear seatbacks allow the standard cargo area to be expanded to a spacious 68 cubic feet, giving drivers room for all of their road trip and day-to-day needs. The competing Compass offers a standard 27.5 cubic feet of cargo space that can expand to 59.8 cubic feet with the help of its 60/40-split-capable rear seats. The 2019 Ford Escape is sure to turn heads with its 17-inch steel wheels with Sparkle Silver-painted covers. Inside the cabin of the Escape is an 8-inch color LCD capacitive touchscreen and Ice Blue® instrument panel cluster lighting. Park with ease in the Escape with the help of the standard rear-view camera, letting you see more of what is around you and your Escape.